It's funny how Pinterest has really seemed to catch fire of late. I don't even really remember when I joined – I just remember coming home and asking Mary, have you heard of Pinterest? Of course her response was: yes I have an account and you should follow me. I am always a day late with her but I do feel I stumbled across a very useful site that I now use daily! For those of you unfamiliar with Pinterest, it's a sort of bookmarking site that allows you to gather and "pin" all the things you want to remember — then categorize them into different board or categories. As you could probably guess, I primarily use the site to bookmark ideas for food, recipes, and projects I'm working on or would like to take on. 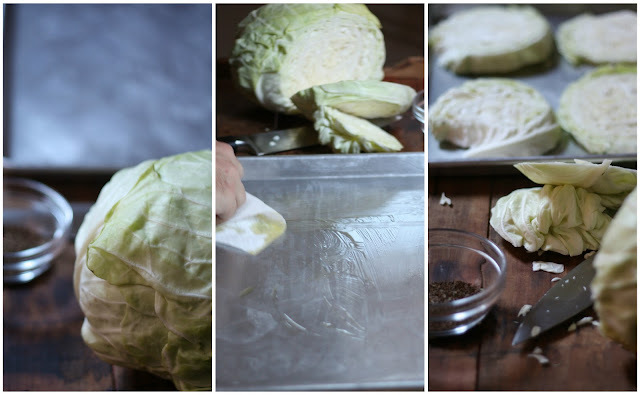 Well this post was born from Pinterest since I came across a version of today's roasted cabbage recipe which originally came from a recipe on Martha Stewart – hence the value of Pinterest as Martha Stewart is not a site I frequent (sorry Martha). Knowing me, I of course couldn't just follow her recipe — I had to let a little of my Hungarian side take over and make this dish one of my own. I am sure my grandmother is smiling down proud! Carefully adding a slice of bacon to each round, I then roasted these guys in the oven at 400 degrees for 45-50 minutes or until bacon was crisp and the edges of the cabbage became roasted. 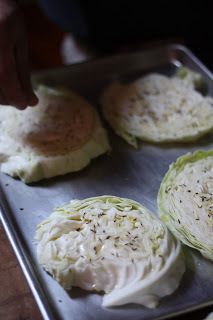 Removing carefully from the oven I then added a dollop of sour cream and sprinkled them with Hungarian paprika. Let me set the stage up for the photo above: It's Valentine's Day and your fixing dinner. 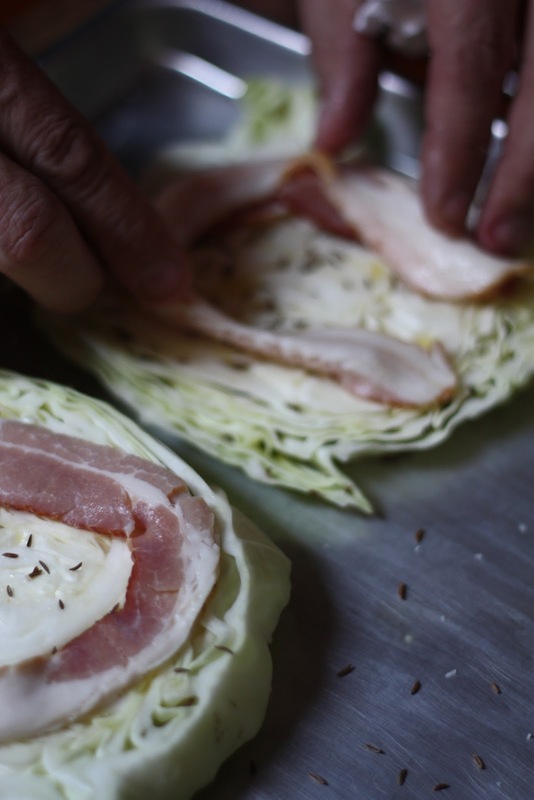 How about serving this dish as a side to beef or pork with a heart shaped piece of good old smoked bacon? An elegant rustic twist sure to impress and exploding with flavor! E.A.T. Tip: You can certainly stay the vegetarian route with this dish and omit the bacon! Have you joined or checked out Pinterest yet? If so, feel free to follow my boards here. So Martha, how is that for a twist on your version? Monica, you got that right! This looks delicious! I love roasted cabbage. 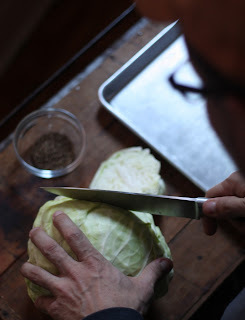 Or sauteed cabbage. 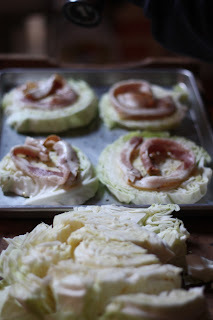 Or steamed cabbage. I just like cabbage. Actually, Morning Star makes fake bacon that is verrrry delicious :) I know it might not sound appealing to your carnivorous self, but for any vegetarians out there, "bacon" is possible! Kristen, I actually have had that as we have a restaurant close to the house that is vegetarian/vegan. Actually they can do everything vegan except for a pizza that they put egg on and I really like the place. I did a short vegan stint back in early 2011 which you can check out here if you would like. I have been committed to adding more veggies into my diet and am so happy I have.